Well, we all know I love to cook! The kitchen is my favorite place to be, and anytime I get the opportunity feed anyone other than myself, I’m thrilled. Most days the only person I have the pleasure of cooking for is my husband. If I cook something and he doesn’t love it, he’s always so gentle in telling me. He will say, “I loved _____ about it but maybe it could use more ______ “ (which most of the time ______ is sugar). If there is anything he has a weakness for, it’s the sweet stuff! Yesterday was Easter and this year Wiley and I went to church, celebrated Jesus and then spent the entire day with just the two of us, and Tootsie and the new baby chicks. We love spending holidays with family and friends but it was kind of nice to just be together. Oh yeah, did I mention that we got baby chicks on Saturday? Well, we did! They are 5 days old and are just the cutest things. Tootsie isn’t quite sure about them yet, she thinks they are small squeaky toys and is very eager to play with them. We named the chicks Rosemary and Lavender; it’s a bit hard to tell them apart so I painted Lavender’s toenail purple. Anyhow, let’s get back to cooking. 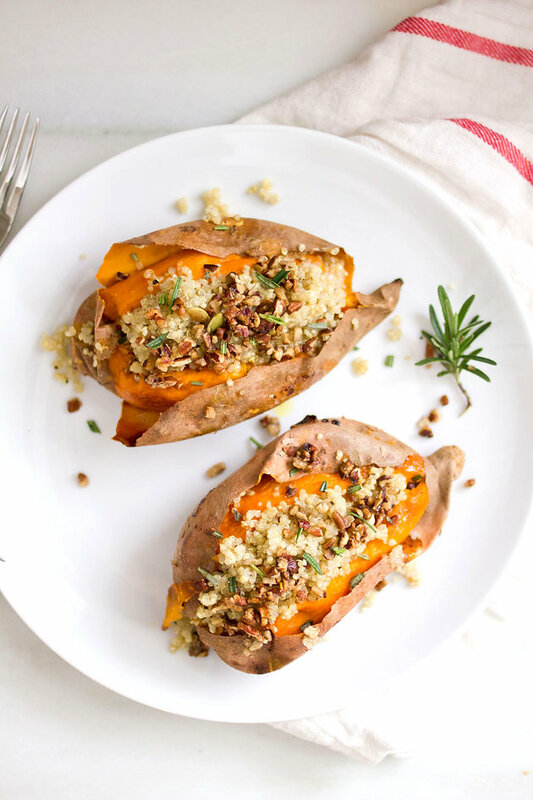 For Easter lunch, I made these stuffed sweet potatoes and they were a hit! They take a little while to cook but if you have a bit of patience, it will certainly be worth the wait. Preheat oven to 400 degrees F. Using a fork, poke holes around the sweet potatoes, about 5 times. Place them on a baking sheet and cook for45 minutes or until soft. Meanwhile, cook quinoa. In a small pot, heat vegetable broth over high heat, once boiling add quinoa and reduce to medium high. Cook for about 15 minutes or until liquid has been absorbed. Add in the salt and pepper. In a small pan, heat pecans and honey over medium heat. Stir every 3 -5 minutes until maple syrup has covered pecans. Remove from heat. Once sweet potatoes are finished cooking, removed from oven. Cut a slice lengthwise in the potato but not all the way in half. Using a spoon, put half of the quinoa into each potato and sprinkle with candied pecans. Garnish with fresh rosemary. Serve warm.